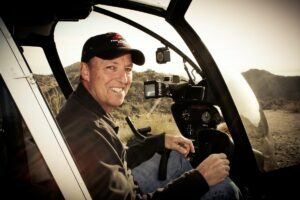 Chopperguy founder Bruce Haffner brings his photography and flight experience to your production. He’s won 15 Emmy Awards for his television photography and production work and has over 10,000 hours of flying helicopters in his logbook which totals more than a year of his life. Bruce, his wife Lisa and four children live in Scottsdale, Arizona and when he’s not flying, he’s driving his kids to their hockey and football games. Bruce also just learned to play hockey, rides dirt bikes with his sons, snowboards with his daughters and enjoys the gourmet meals his wife, Lisa, an accomplished chef, cooks. He admits he’s a pretty lucky guy. Visit our Chopperguy History page to learn more. Jerry shows up everyday with passion, a great attitude and he can’t wait to get into the helicopter to work his magic with the camera. But as great as we think Jerry is airborne, his other strength is on the ground coordinating Chopperguy’s computing, social and mobile media. Jerry consistently dreams up new ideas to explore and we are just scratching the surface of content distribution from his research. Chopperguy is lucky to have a guy with Jerry’s talent and our clients benefit from his abilities. Jerry, his wife Marva and SIX(!) children live in Scottsdale, Arizona and he splits his family time and Chopperguy responsibilities with his other passion: leading Boy Scouts into the Arizona wilderness on hiking adventures. Nobody comes to work more passionate about flying than Aron. 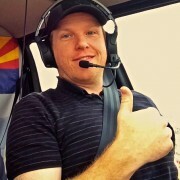 An Arizona native, he grew up racing exotic slot cars…then go carts…and now he’s an awesome TV News helicopter pilot. He plays a mean electric guitar and dreams of being a rock star some day. 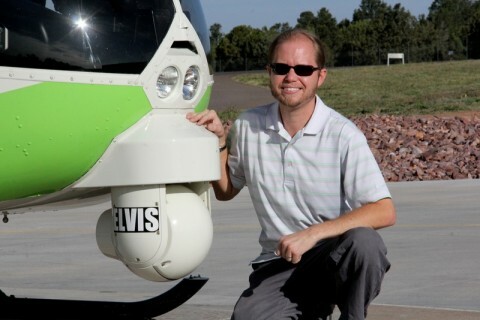 Don’t tell him, but we already think he’s a rock star here at Chopperguy.